Manchester: Lyndsay Faye - 'The Whole Art of Detection: Lost Mysteries of Sherlock Holmes"
Internationally bestselling author Lyndsay Faye was introduced to the Sherlock Holmes mysteries when she was ten years old and her dad suggested she read Sir Arthur Conan Doyle's short story "The Adventure of the Speckled Band." She immediately became enamored with tales of Holmes and his esteemed biographer Dr. John Watson, and later, began spinning these quintessential characters into her own works of fiction--from her acclaimed debut novel, Dust and Shadow, which pitted the famous detective against Jack the Ripper, to a series of short stories for the Strand Magazine, whose predecessor published the very first Sherlock Holmes short story in 1891. Faye's best Holmes tales, including two new works, are brought together in The Whole Art of Detection, a stunning collection that spans Holmes's career, from self-taught young upstart to publicly lauded detective, both before and after his faked death over a Swiss waterfall in 1894. In "The Lowther Park Mystery," the unsociable Holmes is forced to attend a garden party at the request of his politician brother and improvises a bit of theater to foil a conspiracy against the government. "The Adventure of the Thames Tunnel" brings Holmes's attention to the baffling murder of a jewel thief in the middle of an underground railway passage. With Holmes and Watson encountering all manner of ungrateful relatives, phony psychologists, wronged wives, plaid-garbed villains, and even a peculiar species of deadly red leech, The Whole Art of Detection is a must-read for Sherlockians and any fan of historical crime fiction with a modern sensibility. 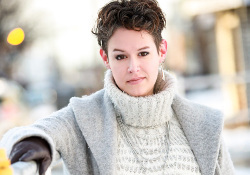 Lyndsay Faye is the author of five critically acclaimed books: Dust and Shadow, The Gods of Gotham, which was nominated for the Edgar Award for Best Novel, Seven for a Secret, The Fatal Flame, and Jane Steele. Faye, a true New Yorker in the sense that she was born elsewhere, lives in New York City with her husband, Gabriel.